Twin Ring Motegi is a famous race track in the Kanto region of Japan, if Google search results are to be trusted. It is home to MotoGP’s Grand Prix of Japan as well as the former home of Indycar’s Indy Japan 300. Twin Ring Motegi was built by Honda and still owned and operated by Honda, albeit under the subsidiary MobilityLand. When visiting Motegi, you can see many similar shops to Suzuka, another Honda built, owned, and run race track. One of the main reasons I love going to races in Japan is the food. When I went to the F1 Grand Prix in Malaysia and Singapore, there was a definite lack of variety when it came to food. I could easily go around and get basic items to eat but generally speaking, inside the track, it was not as good as in Japan. Singapore does have the valid reason that the race is held downtown, so nearby food courts are very accessible to race fans. Malaysia is a different story where the food was overpriced and the quality wasn’t very good, aside from the good satay. Both Motegi and Suzuka have good food but I may have a bias as I do enjoy eating Japanese food, but the sheer variety available in Japan is amazing. To give a quick contrast, I tried nearly all of the food available at the Malaysian Grand Prix in one weekend, but when I go to the Japanese Grand Prix in Motegi, or even to a lesser extent Suzuka, it is impossible for me to try everything and I have yet to try everything at Motegi even though I have been to that track several times now. Japan has a love affair for noodles. It is very common to go to various sporting events and see people eating bowls of noodles. My first experience to see that was in the Tom Selleck movie, Mr. Baseball. Whenever they showed people eating in the stands, you could see a steaming hot bowl of noodles. Motegi is no exception either. 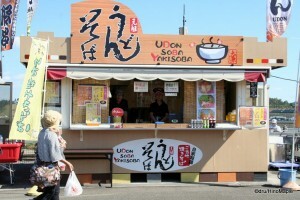 It is very easy to see stands selling hot bowls of ramen or udon and you will see people carefully trying to get these piping hot styrofoam bowls back to their seats. It is fun to watch these people gingerly walk back to their seats but it is very scary when they have to pass over you. I tend not to eat the noodles just for this reason. 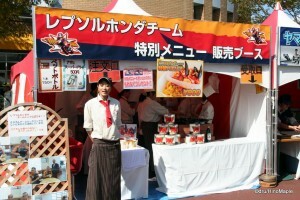 The other major dish that is available at all sporting events is curry rice. It is very easy to prepare, buy, and eat curry rice. They often have boxes full of rice and they just ladle the curry on top based on the order. It is a wholesome meal that is very easy to prepare and easy to eat. There is very little mess and it is very filling and satisfying. Different shops have different varieties but they are all delicious. Prices may vary depending on the event as well as the type of curry offered but they will all satisfy you and if it is a cool day, keep you warm at the same time. During the MotoGP event, they had a couple of special Spanish tents where you could buy food that was created by a couple of the race teams. The Repsol Honda catering team designed a paella dish in tribute to one of their top riders, Dani Pedrosa. It is the same paella that the team eats. Generally, the teams create food that their riders love that is also nutritious. While they are in Japan, they will still make Spanish food for their Spanish rider, and in the case of Repsol Honda, they also make Australian food for their other rider, Casey Stoner. It wouldn’t be fun if there wasn’t a little competition, so next to the Repsol Honda food stall was the Yamaha food stall. The Yamaha food stall also had Spanish food in honour of their main star, Jorge Lorenzo. The team chef created a pasta dish, Spanish style of course, that was equally as appetizing. The price was high at 900 yen for one serving, so I could only try one. I decided pasta was an easier choice to eat and it appeared to have more volume. It was very delicious but I’m not sure it was 900 yen delicious. For take-out food, it was good, but for a restaurant, I’m not too sure. It did feel like good home cooking though, and if I was a rider, that is more than enough. 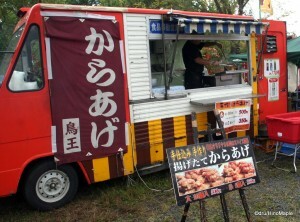 The main food to get when at the races is the yatai food, or rather the kushiyaki. Kushiyaki is anything that is grilled on a stick. It is very easy to find grilled items at the track as they have stalls everywhere. You can buy everything from what they call a “tornado dog” which is a long sausage wrapped around like a lollipop on a stick to the typical yakitori sticks. I often stick to the grilled steak and grilled bacon. The grilled bacon is a very simple dish. They just put huge cubes of pork, with an ample amount of fat of course, and season it with salt. It is really simple and really delicious and a perfect match for beer. The best kushiyaki you can get is the steak. This year I learned how important it is to go to the proper place to get the grilled steak. Every year I go to the same guy at the same stall to get my steak. This year I tried another place because it was convenient. The meat was good and it was well done but it wasn’t spectacular. It was prepared ahead of time and all they did was dip it in sauce and give it to me. It wasn’t as succulent as my favourite cook made it. 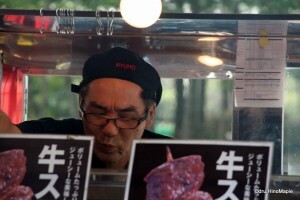 I went back to my favourite place the next day to get the best steak on a stick at Motegi. It is a small truck with an old man inside and there is often a line outside. He always puts an ample amount of sauce inside the bag that holds the steak sticks as well and he never overcooks the meat. He has been doing this since I could remember, although I felt it was a different person this year. Perhaps he changed his diet or something but he looked different. The location was the same and the taste was excellent even though I waited nearly 20 minutes before I ate it. As long as I can remember, I will only go back to his truck to get these steak sticks again and I doubt I’ll ever go to another location again. The last thing to think about is the beer. Like all sporting events I go to, I want to have a nice beer. Motegi is sponsored by Asahi and you can find cans of Asahi Super Dry everywhere. It is the official drink of the circuit and it is probably true of Suzuka too. I don’t have a problem with it but I am not a fan of Asahi Super Dry. Thankfully Motegi also has a local craft brew variety. A local brewery, Romanic Village (ろまんちっく村) produces a lot of beer just for this event and I have watched them grow every year. They started off with just one stall in the main grandstands but this year they expanded a lot. They now have at least 3 stalls where you can get beer on tap and it is very good. They also expanded their line from one type of beer to three. They all have a distinct flavour and they all have great names too. 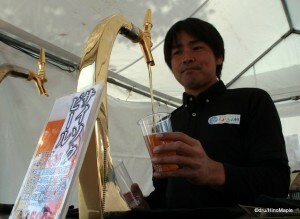 Each beer has its own name but the most popular one is the Saisoku Beer. They also had one called Dog Fight and I think another one called Black, rather Kuro (クロ). They aren’t stingy either when they pour you a cup. They have small cups for the beer but they fill the cups to the point that you can’t walk without spilling a bit. You actually have to take a few sips before you can walk around. You can also buy bottles of the beer and they do make nice gifts. The best part is that it is a local brewery so you can’t get it easily outside of Tochigi. In fact, you can’t even get the special brew outside of the race track. I highly recommend trying all three brews. They are delicious and specific to the track. It also helps the small companies stay alive. If you have a chance, also try their regular brews if you have a chance, but unless you order online, you will have to go to Utsunomiya or Nikko to try it. As you can see, the food in Motegi is great. Japan loves food and has a huge travel industry based on food. People travel to Osaka to eat okonomiyaki, or Hiroshima to eat oysters. While you can get foods from around Japan in Tokyo, people still want to go to the source. The races take this culture and they run with it. I am always searching for my favourite track foods but at the same time I really want to try the other foods too. Twin Ring Motegi tends to be more regionalized with their offerings. You can still get the typical yakisoba, beer, and everything else you can imagine. While the offerings may be typical of any sporting event in Japan, they have a very unique local twist. 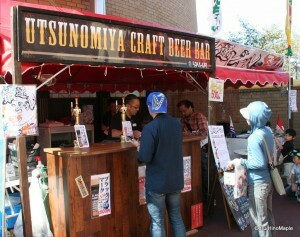 In Motegi, you can add the Romantic Village craft beer, local chefs, and even Utsunomiya Gyoza. I tend to order the same things when I go to Twin Ring Motegi but after writing this I feel that I should try as much as I can the next time I am in Motegi. Thankfully the Japan Grand Prix will be held until 2018 which means I have several years to eat my favourites and hopefully discover new ones too. Note: Click on the ファストフォード links at the menu list on the left to see the best eats during the races. This entry was posted in Kanto Food and tagged Asahi, Asahi Super Dry, Casey Stoner, craft beer, curry, curry rice, Dani Pedrosa, Dog Fight, F1, Grand Prix, Grand Prix of Japan, Honda, Ibaraki, Indy Japan, Indy Japan 300, japan, Jorge Lorenzo, Kanto, Kushiyaki, Land, Mobility, Mobility Land, MobilityLand, Motegi, Moto GP, MotoGP, Mr. Baseball, noodles, paella, pasta, ramen, Repsol, Repsol Honda, Romantic Mura, Romantic Village, Ryuho, Saisoku Beer, soba, steak, Super Dry, Suzuka, Tochigi, Tom Selleck, tornado dog, Twin Ring, Twin Ring Motegi, udon, Utsunomiya, utsunomiya craft beer, Yakisoba, Yamaha by Dru. Bookmark the permalink. Champagne at a race? Never. Give me beer, always. 😀 Well, often I need a refreshing bottle of water but that is due to the heat.